A swimming pool is a great investment. It makes your property fun and increases its market worth. While installing the swimming pool in itself could be expensive, adding features like pool railing or doing a pool cover installation is relatively affordable. These additional features will make your pool safer and easier to maintain. The cost to install a pool cover will vary depending on a couple of factors. The following guide will elaborate on these variables and help you understand how much you will need to get the perfect cover for your pool. How Much Will It Cost To Install a Pool Cover? Expect to spend anything between $100 and $2200 on your pool cover installation. Most pool owners willing to do tradeoffs between quality and appearance will spend an average of $700 on pool cover installation. Always shop around and explore your options before making a final decision on pool cover installation. You might want to combine this with other fixture installation, for instance fun things like slides and diving boards. Most contractors will offer you a discount if you purchase pool fixtures in bulk. The type of installation will dictate the labor, skill and material needed to get the job done. This is directly proportional to the cost to install a pool cover. Above the ground pools need some overlap room. This will increase the overall size of the pool cover hence its cost. Is Pool Cover Installation Important? The cost to install a pool cover is always worth it. A good pool cover will not only keep your pool safe but also moderate the weather elements. 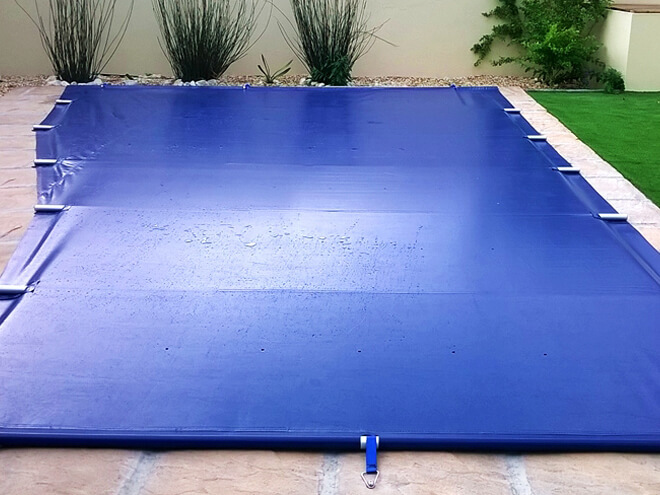 A good pool cover installation could keep your pool from freezing and cracking in winter. It could warm your pool water on summer hence doing away with the need to spend electricity warming up the water. It is your responsibility to secure your swimming pool whenever someone isn’t around. This will keep kids and other people from accidentally falling into your swimming pool. In some states, you could be sued for negligence if someone drowns in your pool. A pool cover will also save you the pain of cleaning up after small animals and other unwanted stuff that could drop into an uncovered pool. You might also get better labor rates from the pool cover installation contractor if you live in a certain area. imply enter your zip code in the space provided to request a no strings attached estimate from local professionals.